Combination board combines the best of Total Erase and the attention-getting functionality of Quartet's Prestige black embossed foam bulletin board. Total Erase dry-erase surface resists staining and ghosting from dry-erase markers. The subtle grid pattern on the dry-erase board keeps writing neat. Included mistake-proof "Easy Mounting" hanging system makes hanging the board easy. 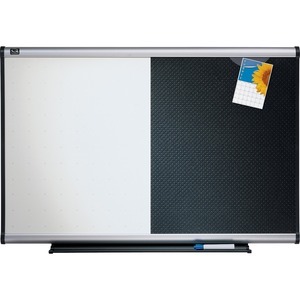 Combination board also includes an aluminum frame, dry-erase marker and convenient Quick Clip. Simply slide items under the clip; no pushpins needed.